PM sent to MnSportsman. Please strike my wish from the list at your earliest convenience. Yet again B&B has come through for me, you guys are a great community! Here's (I hope) the updated list. Grizzly - I wish for a crooked/spoon knife. Production, custom, self made. Gifted by Big Chief Knife. Chief Big Knife - knife of some sort, possible antler/bone handled knives, fan if any decent blade, always been a fixed blade guy but I value a good folder. Gifted by Kanukkarhu. xj35's - O1 or 1095 knife blank. Gifted by Jackelope10mm. wannabe - suspenders with button hooks to attach to wool pants. NO CLIP TYPE. G Gifted by MnSportsman. Kanukkarhu - Cap in green or earth tones with USA Flag on it. Gifted by Matt Chaos. 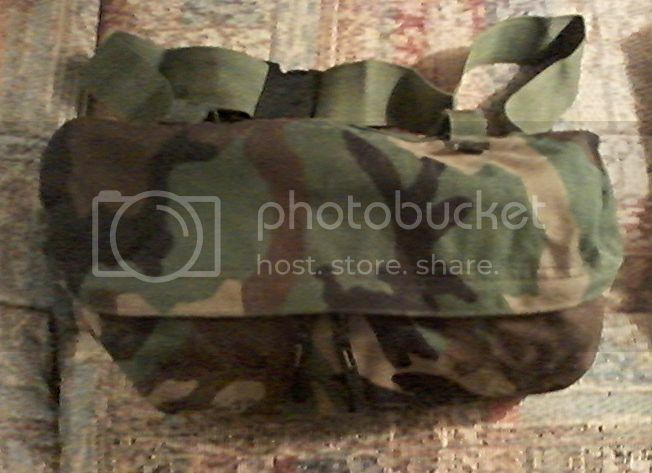 NatureBoy, I have a woodland camo buttpack, PM me your address and I'll get it out next week. Thank you so very much Bighat! Sorry for the late response, working 6 day workweeks until after New Year's. Can't wait to give the buttpack a good workout when this schedule slows down. PM sent and thanks again! @Matt Chaos - the update I did (trying to be helpful) has three of those wishes fulfilled. I didn't even catch those. Someone get Trkbusa06 some orange G10 or Micarta!!! This is the closest we've ever been to fulfilling every wish on the list! How thick should the G10 or micarta be? I sent the water bottles out today. What is g10? I have some rough cut cedar board that might make a nice handle. Hot glue makes a good handle material. ugly but soft and strong. If you want I have some black micarta, I also have a lot of other wood, including burl, I may also have some scraps of OD green micarta and black g10, I'll check in the morning if your interested. Let me know if I need to update the list. My wish gift from Bighat arrived yesterday (Friday) afternoon while I was at work. When I came home the box felt too heavy for a buttpack....I opened the box like a kid on Christmas morning! In the box was a USGI woodland camo buttpack that will go great with my USGI load bearing vest! I opened up the buttpack and was just floored when I found a coyote 10x12 (I think) tarp and a big hank of paracord inside! Bighat I cannot express how much I appreciate your very generous gifts. I am just overwhelmed and can't find the words....I can't wait for my work schedule to go back to 'normal', so I can put your gifts to great use. God bless you and yours and Merry Christmas!!! You're more than welcome. The tarp is a 10x10 coyote tarp from that "other" bush**** site I used to frequent. I got it before things became so commercial. Kept it as a reminder of better times. Its a really nice tarp that I hope you get a lot of good use out of. 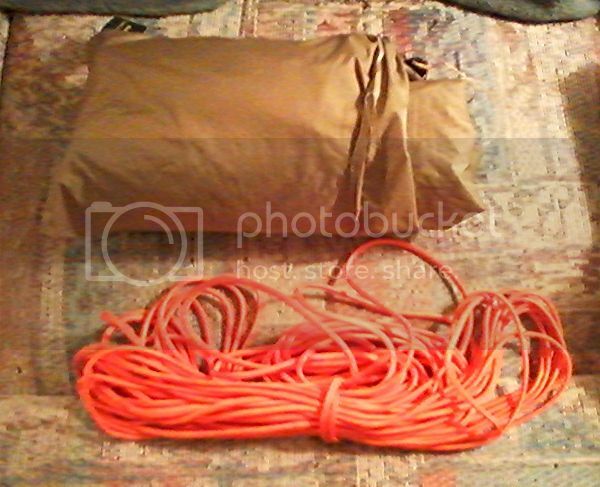 Paracord is actual mil-spec international orange, about 60 feet. I was watching this thread hoping for something to pop up I could help with. Split Fruit wood logs (or maple or rotodendren) for spoon carving would be great! A nice compass would be great. Received my suspenders from Mnsportsmen today. Thank you very much, they are perfect. It's exactly what I was thinking, Matt! Thanks! I wore it on my walk tonight -- near froze my ears off, but it was worth it! SO cool! Matt Chaos is good people. I'm getting the time to finally work on the gift I'm sending out. Hope they like it. Yep it's packaged up and will go in the mail tomorrow when I go to town. Very nice Matt. You done good. K. you need the big beard. Didn't you have one? My face is a chameleon. Today goatee; tomorrow bare as a baby's bottom. Who knew ADD could affect facial hair?? LOL. You are fighting time. Losing battle. That hemmoroid will not disapear. Beard. Grow it and be proud! Lol! Not fighting, Max, denying! I have a 2.5 inch thick by 2 ft long branch of orange tree thats been curing in my garage for about 4 years now... Would that work for ya? Thank you to everyone for participating in this year's Holiday Gift Exchange. It looks like most everyone's wish was granted. If any one would like to fill an open wish that would be great. Thanks for getting this going Matt! Now I wonder... What's your Christmas wish, Matt?